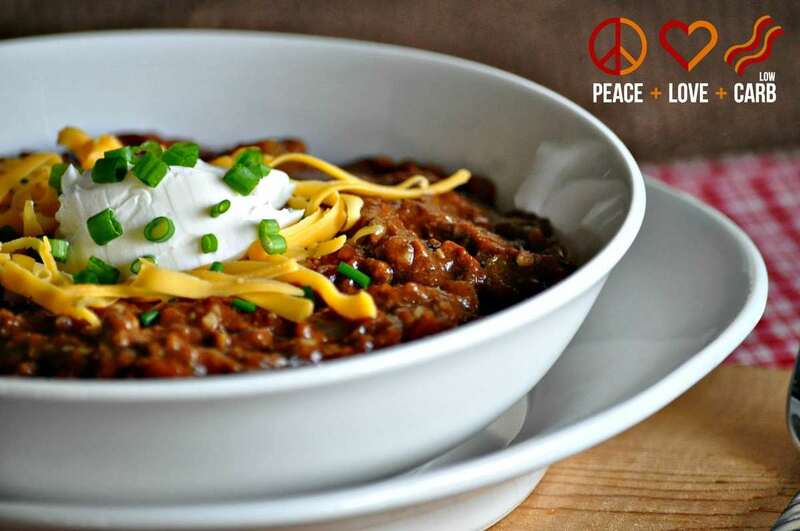 Low Carb Chili – All the amazing flavors of chili, without the beans. I think you will find that you don’t miss them at all. 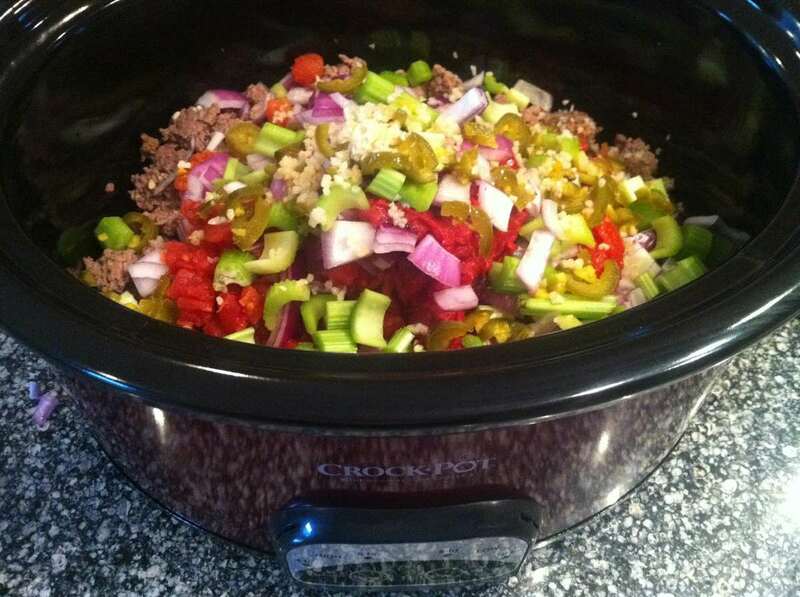 Nothing screams wintery comfort food like a slow cooker full of low carb chili. Even better when you top it with lots of sour cream and sharp cheddar cheese. This recipe is so good, you won’t even miss the beans. This chili does have a little bit of kick to it. If you do not like spicy, you can always omit the cayenne and/or the jalapenos… I love to serve it alongside my Cheddar Bacon Jalapeño Biscuits. It freezes really well. If you have a large slow cooker, I recommend making a double batch and freezing half of it. Cook once and eat twice!NOTE: If you make this low carb chili, then you should immediately turn around and make this Keto Chili Pot Pie Casserole. You will thank me. Your spouse will thank you. Your kids will thank you. Your dog will wish he could thank you. I think you get the point. 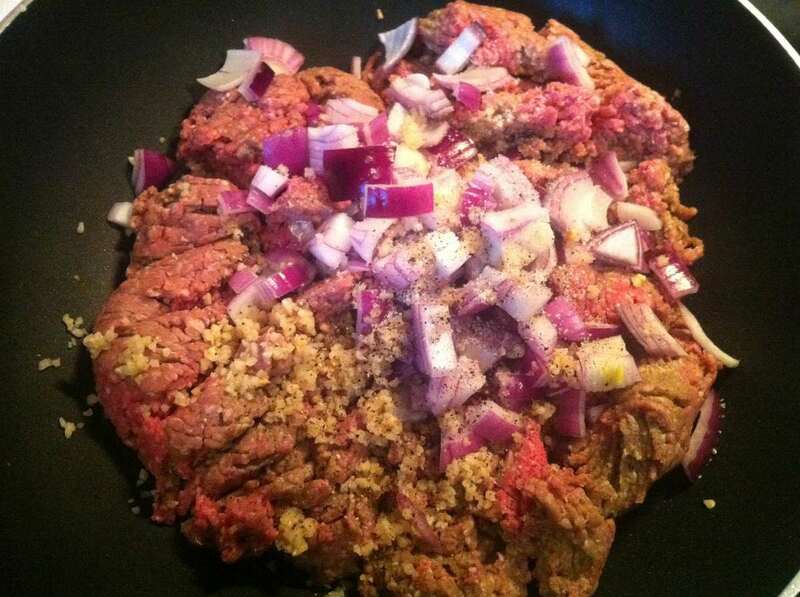 In a large skillet over medium-high heat, add ground beef, half of the onions, 2 Tbs. minced garlic, and salt and pepper. Once the beef is browned, drain excess grease from pan. 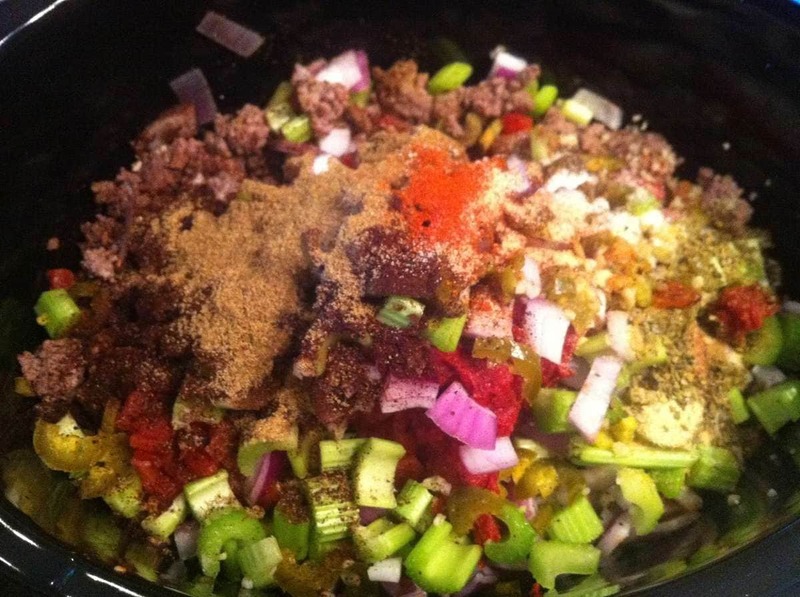 Transfer ground beef mixture to slow cooker. 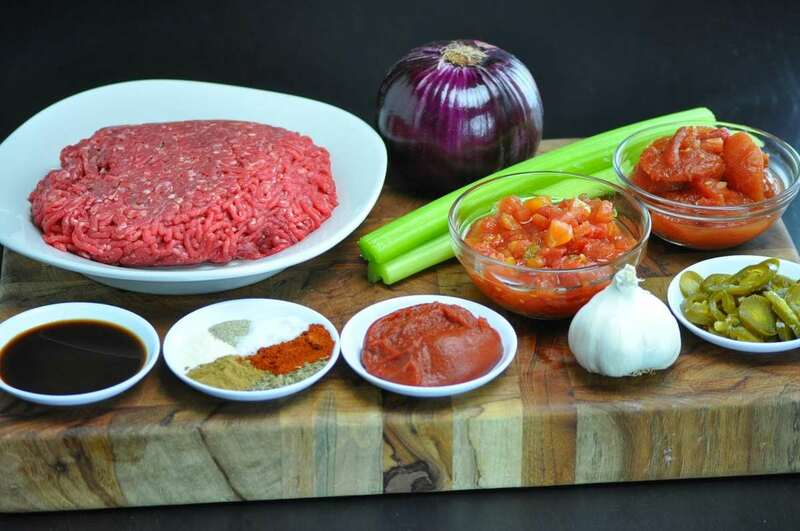 Add remaining onions, garlic, celery, jalapenos, tomato paste, tomatoes and chilies (with liquid), stewed tomatoes (with liquid), Worcestershire sauce, chili powder, cumin, salt, cayenne, garlic powder, onion powder, oregano, black pepper, and bay leaf. Stir until all ingredients are well combined. Cook on low 6-8 hours. I need this recipe! Looks delicious!!! This chili is one of my favorites…LOVED IT and I am making it again this weekend in order to bring it work with me all week and eat for lunch! So happy you enjoyed it. Thanks so much for sharing! I finally found this recipe, I saw this on your fb page but I was unable to bookmark it. Now, I can cook without the beans. Oh my, do we have a hot one here!!! So good looking a lo-carb recipe that the ONLY thing I would do different would be to cut the beef by half … subbing ground turkey in its place. Well, I might also LIGHTLY brown the beef+ground turkey combo on the grill to give the meat an even smokier savor. You don’t happen to know the calorie count for this recipe, do you? lol Looks yummy!!!! I made this for dinner last night. I must say that the spices listed on this recipe were spot on! There was just enough heat and the flavor was fantastic. I changed a couple of small things for fun. Rather than 2.5 lbs of ground beef, I used about a pound of ground beef and 1.5 lbs of beef stew meat cut into small chunks. Also, I reduced the amount of tomato paste to just two tablespoons to cut back even further on the carbs. It definitely had enough tomato flavor even with this small amount. The chili was even better the second day as leftovers. Love this recipe and am keeping it close for the upcoming football season. But your looks super Yummy… Bonus the husband can take or leave the beans as long as its chunky. Thanks! Going to try tomorrow. Made this for dinner tonight, and it had just the right amount of heat (minus the jalapenos)! It was fantastic! So happy you enjoyed it. Thanks so much! Making it now but there seems like there is not enough liquid? It’s chili. It is supposed to be thick 🙂 Did you drain the juices from the cans or add them to the crockpot? Oh I added the juices! I even added water to the can of tomato paste to get some of it out and add some liquid. It seems all meat. Maybe after it cooks, some liquids will losen up. I love the “brothy ” part of chili too! I’d love to hear how it turns out. I hope you love it. I don’t know what the weather is like where you are, but where I am, it is definitely the perfect day for it! 181 calories, 11 carbs, 12 fat, 8 protein, 32 Cholesteral and 7 sugar grams. I just used all the canned goods, my meat was too high in fat, I always use lean but I did not have the recipe in front of me when shopping. Just now sure why the carbs turned out so high? I do hope it makes at least 6 cups servings since right now it is mostly meat. I do appreciate your help! Thank YOU! Very good. It only made 6 cups for me and that was after adding a can of broth to it. I am so afraid of how many carbs this will be. I put in the ingredients and for 16 servings it said 11 carbs per cup but now that is only made about 6 cups, I am sure I consumed a lot of carbs. Will make it again. Good spices. Brilliant recipe! I just made it today, and it is divine! My husband loved it, too! Thank you for the recipe–for ALL of your recipes! So appreciated. No problem. So happy you liked it. Last time I made it, I didn’t even get any. My husband ate it all. Sooooooo good!! This is my new favorite chili recipe! This is the second time I’m making it this week! Thank you for the delicious recipe!! Thanks so much. Happy you enjoyed it. Thank you! Yummy! We didn’t even miss the beans and my husband and I love beans in our chili. Spices were perfectly spicy. 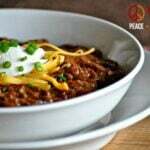 We will definitely be making this chili recipe again and are excited to try more recipes from peacelovelowcarb.com. Thank you! Thanks for the feedback. So happy you liked it! A very yummy chili recipe! but agree with another comment that it didn’t make nearly 16 cups. I added least 2 cups of liquid to thin it out since I wanted to make it stretch a little and it made 11 cups. Changed the macros to 210 calories per serving and 6 net carbs. Still pretty good for chili! Do you think this would be okay with ground chicken or turkey? And if so, would you cook it all the way through prior to loading it into the crockpot? Thanks! I cook ground beef in the crockpot all the time. I just have to periodically break it up and stir. 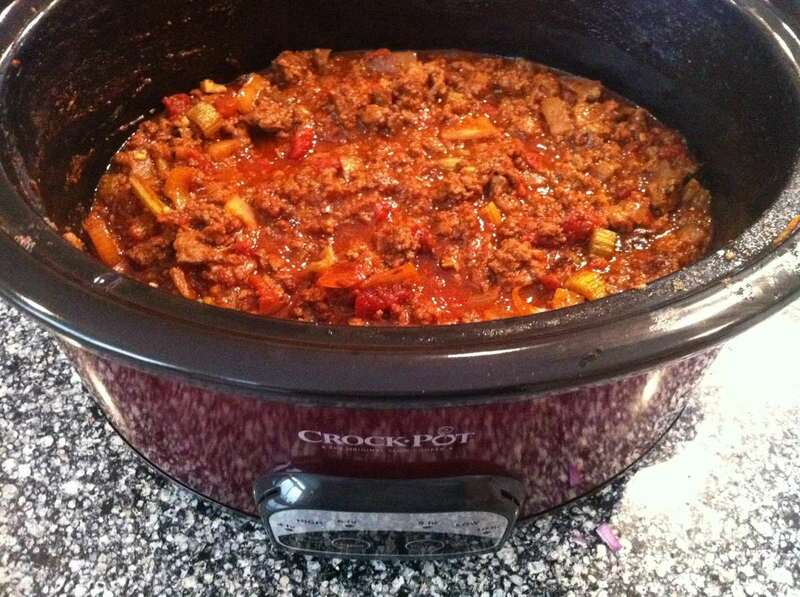 My suspicion is your chili can be made 100% in crockpot. Can’t wait to try it! 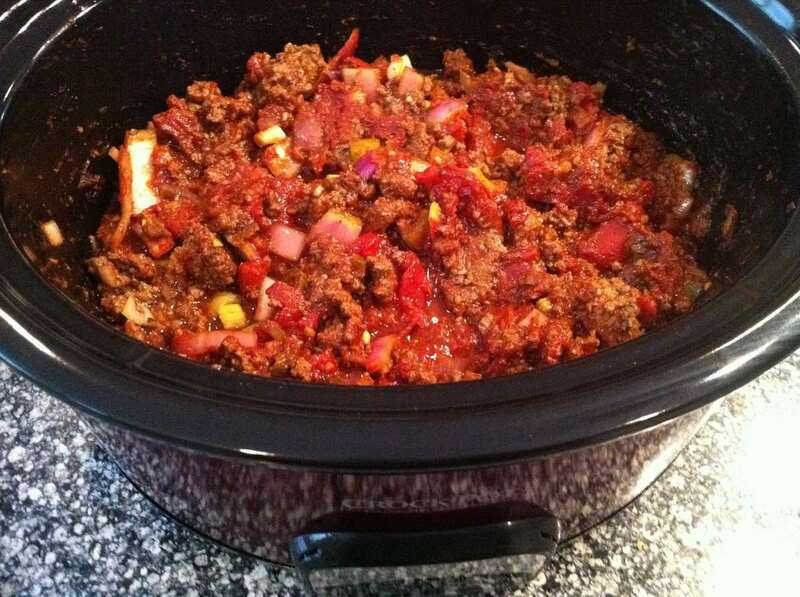 So I tried this chili yesterday and was so anxious to try it as it cooked in the slow cooker. I was so impressed with it, it’s the best chili I have ever had! Thanks for the recipe it’s delicious! I made this chili yesterday and it was the best chili I have ever made. Instead of the list of dry spices I used a pack of McCormick’s Hot Chili Mix. I also dropped the Jalapeños. I wish I could find a low carb, gluten free hearty bread recipe too. Made this today, not in the crockpot and with more jalapenas & garlic, very thick put it over shredded lettus w/dollop of sc & shredded cheddar, very spicy my husband loved it…….so did I,did not miss the beans. This looks really good and incredibly easy. What do yo mean by ‘mounded’ if reference to the cumin? I just mean heaping as opposed to leveled off. Made this tonight for dinner. Use regular pot on the stove because I didn’t have enough time 🙂 I also used 1lb of grass fed hamburger and 1lb of grass fed beef cubes. Didn’t make mine quite as ‘hot’ as yours but everyone raved at the dinner table! I’m not usually a fan of chili, I think because I don’t really like the beans. This beanless chili was absolutely perfect for me. My non-LCHF/Primal family members had some pasta (gag) with theirs. Oh…I made a yummy cheese sauce for the pasta eaters, but gotta say, it was quite yummy drizzled over the chili. mmMMmmmm Thanks for the great recipe! I now have a chili that I can eat that tastes delicious! Can I ask what measurements of spices did you use to make it not as spicy? We love spicy! I added a minced habenero and a 4 oz can of organic tomato sauce (of course that is less low carb because there is some sugar in the tomato sauce). Huge hit! Awesome recipe. Absolutely awesome! Yay! Thank you! So happy you enjoyed it. Holy cow! Maybe it was the chili powder I used, but this was WAY too spicy (and I like spicy foods!). I’m going to need to make a plain batch and mix them together, so I hope it freezes well. This is the best chili I have ever made! Easy recipe. I used leftover bear roast from the night before for the meat. Tasted better than Steakhouse chili! Thanks for sharing! Thanks so much. So happy you enjoyed it. I made this chili yesterday and we LOVED it! The flavor of this is just phenomenal and so satisfying with the cheese and sour cream topper. I didn’t have onion powder or the jalapeno’s and still was spicy enough for us. Thank you for an awesome recipe I will be making often! I prepped this recipe this morning and threw it in the Crock pot because, well, Sunday! And football…duh. lol. Right now my entire house smells amaaaaazing. I did keep the onion because I love the flavor, but modified it. I took a quarter of the onion and grated it. You still get all the full flavor with only a quarter of the carbs (and my picky boyfriend won’t eat chunks of onion so BONUS!). I also had to get creative with the eat because my grocery store had zero jalapeños…who does that? I there in a poblano and some red pepper flake. Fingers crossed! Thanks for the great recipe!!!! (It will be served over my homemade spicy sweet potato fries…can’t wait). Can’t wait to try this chili, looks and sounds amazing. I’ve lost 12 pounds doing the low carb thang in the last three weeks and this website really gives me a variety of foods to prepare.. Thank you peace love and low carb! This looks amazing, can’t wait to try it! Thank you peace love and low carb! I made this today. Absolutely love it. I didn’t have tomato paste so I could down a 16oz can of tomato sauce (medium for 7 minutes on stove). Used only 2 pounds of ground beef. The spices were fabulous. Did not think I could like a bean-less chili! Thank you for this recipe. I have your cookbook with the three meat chili and that is a different recipe. Which one tastes better to you? I havent made either one yet. Thanks! This chili is really really good, and yes spicy! I used 2 lbs of 7% lean turkey instead. I did add a little water and was able to get 10 full cups of chili- definitely not 16- and with putting everything into My Fitness Pal the carb count is a lot higher than I wanted – about 13 net carbs per serving. Next time I will cut corners with the tomato paste etc to cut carbs..
Hello! I made this chili in the crockpot. Really good. I cut the jalapeno to an 1/8 of a cup and used a little less onion. It was fantastic. Will make again. Made this today.Love chili even in the summer.The spicier ,the better.Never thought that I would eat chili without beans,but this is the best chili I have ever made and I have made my share of chilies.Even my husband loves it and he never eats chilies because he does not like beans.He had his with brown rice and I had mine with cheese and sour cream.Thank you for your recipes. Awesome! Thanks so much. So happy to enjoyed it. Yes, it freezes and re-heats quite well. This was delicious!!!! Thank you for such a great recipe!! Just an FYI… Most brands of Worcestershire sauce contain gluten. A lot of pre made seasoning packages do as well. This needs to be noted in the recipe if it is going to called “gluten free”. Hi I enjoy making your recipes. Love the fajita soup and the lemon mushroom chicken recipes. I am curious, if you are already using fresh onion and garlic, why do you add additional ground onion and garlic? This was DELICIOUS! A little too spicy for my boys, though, so next time I will leave out the cayenne and jalapenos, too. I made your cheddar jalapeno bacon biscuits to go with it, and it was SO satisfying! Thank you for a no-sweat slow cooker meal! Excellent! Yes, very spicy! But I left the meat a bit chunky when I browned it ased a pound of mild pork sausage in addition to 2 lb of ground beef- Next time I will use less chili powder and cayenne….I am so impressed with this! Cheddar biscuits in the oven now! oh yeah this is fantastic! I used a few chopped up chipotle peppers in adobe sauce instead of the jalapenos. It added a great smokey flavor! Also it was a bit thick, so I added some salsa that I had in the fridge! Finally, I added a little bit of sugar-free ketchup mixed with broth, to add more liquid. I know, that’s more carbs, but I like a chili with some broth. It was all just fine! This is a recipe that you can easily adapt to your own tastes, but the overall flavor still remains spicy which is fabulous! Just saying! Try it you won’t regret it. Yum! Love the idea of chipotle in adobo. I will have to give that a try. So happy you enjoyed it! I want to leave out the jalapeños and cayenne . Will it be just as tasty ? Have you tried this with chicken or turkey meat? What would the count be? Hi I was wondering if I could cook this on high for 3-4 hours instead of on low for 6-8. Thanks!! Yes, I’ve done that many times. It works great. Made this on Sunday. All I can say is WOW! This chili is so, so good…and it tastes even better the next day! Thanks so much! I agree. It is definitely better the next day! I am in love! I made this on Sunday and could barley stand waiting until it was finished cooking. Best dinner I have had in a long time! Thanks SO much! Awesome! SO happy you enjoyed it. It’s a favorite in our home too. Easy to make and taste delicious! Amazing with a few tweaks!! I used 1.5 pounds of ground beef and 6 ounces of chorizo instead of all ground beef. I added a small can of hot chopped jalapenos instead of the pickled jalapenos. I also added a chopped green bell pepper. Nice heat, great taste!! SO GOOD! Today was my first day experimenting in the kitchen and I made there and the biscuits (no sausage). Even my husband is super impressed. I just took the peanut butter chocolate chip cookie bake, and waiting for it to cool off so I can try it. I pre-ordered your next book and can’t wait to get it!!!! Making this as we speak.. I hope it tastes as good as it looks and sounds.. will update. Simply put, this is damn good chili. This chili is wonderful. I was concerned about how “Kickin” it would be so I didn’t add the cayenne pepper and added only half of the chili powder because I used Rotel stewed tomatoes and they are spicy already. I didn’t have canned tomatoes with green chilies so I used a can of petite diced tomatoes and a half can of green chilies. It was absolutely perfect! Just made this today and wow, it was so good! I left out the jalapenos and half the chili powder as my only personal adjustments. I adapted this for the stove top and used 2 pounds of ground turkey. I made a few other adjustments to taste (fresh jalapenos in addition to the canned, etc. ), but used the basic recipe as a base. I loved it, and know that I will make it again! Thank you! I found this didn’t make 14 servings, more like 9. I cannot seem to find canned stewed tomatoes with Mexican Seasoning in my grocery stores. Where do you find this? Overall a really good chili recipe, I did cut back on the cumin a little bit. and used 1/2 jalapeno. Great for freezing for meals made ahead and just reheating. Thanks! Very tasty. A couple tweaks. Did not use tomato paste, used tomato sauce. I didn’t have pickled jalapeno and worried about adding juice. I have jalapeno in my garden, so added 3 chopped up. Added a green pepper to beef as I cooked it with the onion. I added a tablespoon of cocoa powder, it really adds nice flavor to chili. I used a 28 ounce can of diced tomatoes instead of mexocan chopped tomatoes. I am serving with cheese, sour cream and cilantro. I’ve made this quite a few times in the last couple of years and my family is crazy about it. The spices are perfect! Today is a rainy fall day with snow on the tops of the mountains and the smell in my house while the chili cooked is such a beautiful thing. I usually make chili with beans for my family, but I decided to give this recipe a shot. It was delicious! I consider my homemade chili to be very good, but this was over-the-top good, and I didn’t miss the beans at all. My husband said this was the best chili I’ve ever made. The only thing I did differently was to halve the cayenne and to put the jalapeños on the side. It ended up being the perfect spiciness for my husband and I, but a little too spicy for my kids. I also added maybe a half cup of water and cooked it in my Instant Pot for time’s sake. Thanks for such a wonderful recipe! This chili is the bomb! My hubby doesn’t like beans at all and I’ve been searching for a chili recipe for him forever. This is the one. Just enough heat and so good. Thank you so much! Made this tonight for the first time. Really good. I thought it would be too tomatoey but its not. Good combination of spices. Will make again. I just made this tonight and it was fantastic! I did tweak it a little since my grocery store didnt have pickled Jalapenos. Instead i used 1 fresh Jalapeno with a bit of the seeds and 1/4 can of diced Jalapenos. I also only used 1/2 of a red onion total since I am not a fan of onions. I was a little worried it would be too thick since there wasnt much liquid when I first added everything. After it cooked though, the tomatoes really broke down and created the perfect amount of liquid. I will definitely make again! I made this for the first time last night. Came out great even though I had to sub a couple items I didn’t have like a can of stewed tomatoes and fresh garlic. I didn’t think about it when I making it but is this also gluten free? I don’t see it noted anywhere. Awesome recipe! Thank you. It’s a keeper! I’m writing this as my mouth has the perfect amount of hot. It’s just enough to slow you down because this is delicious you’ll want to inhale. New favorite. BOY HOWDY, this is excellent chili! I used 2.5 lbs of stew meat, shredded half that when cooked to tender, and omitted the jalapenos so my sons would eat it! I did sneak in just a smidge more cayenne cause that’s how I roll…its seriously delicious chili! I discovered your chili recipe almost 2 years ago and it’s THE BEST chili recipe I’ve ever made! I leave out the celery and jalapeno. My husband loves it, I love it – it’s so good! Sometimes I use it to make a chili bake/dip. I pour the chili over softened cream cheese that’s been spread in a baking dish, then top with shredded cheese and and bake! It makes a delicious party dip, or to eat just on it’s own! So grateful for your recipe! Made this chili last night. My husband and son say it’s the best chili they’ve ever eaten. I only added a red and yellow pepper to it, otherwise made it as written..
Made today, very good! Did change the recipe some tho, Only used 2 lbs of a ground turkey/90% lean hamburger mix. Left out jalapeños and cayenne pepper, still spicy enough, added some red peppers, extra half can of mild rotel with juice, and a can of diced tomatoes with juice, plus what the recipe said. We like tomatoes. Lol. Garlic directions were a little unclear to me, so I used 2tsp in with hamburger mix, did not add salt and pepper as it was in the other spice mixture and 3 tsp garlic added to the crockpot. So 5 tsp total.I used the jar minced garlic. Will definitely make again! I started a low carb diet at the start of the new year to help shed some of the extra pounds gained from all the indulging. This recipe is excellent! I followed it to a t and it came out think, with a small kick and filling like chili on a rainy and cold day should be. Thanks for posting! I made this chili today. It is amazing! Followed the recipe to a T and it came out great. I always use different recipes every time i make chili. Kyndra, please do not consider me a pest. I’ve tried a couple of other avenues to contact you regarding your Slow Cooker Soups and Stews e-book that I ordered on Monday (1/14/19) and never received. It’s recipes like these that will carry me through the remainder of the Winter. Would you please see why I haven’t gotten the cookbook? Thanks! I have tried so many different recipes over the last few years… I was sceptical at first putting celery in chili but wow! This is now my fav chili recipe. I made this for dinner last night and it was absolutely delicious! I made the jalapeño bacon biscuits to go with it and I’m so glad I did!!! The were fabulous and complimented the chilli perfectly. I topped the chilli with a dollop of sour cream, chopped cilantro and a bit of grated cheddar. For the biscuits I used aged white cheddar. I’m definitely making this again! Made this tonight. and LOVED IT. Used half ground beef and half stew meat cut into small pieces. Added a cup of water and cooked it in my instant pot, it came out AMAZING. Just the right amount of heat. Definitely a keeper! Kyn. Dra. OH. MY. STARS! This chili is amazingly delicious! Today is my daughter’s birthday. She asked for my chili and her Dad’s burgers. She is brand new to low carb eating. I remembered reading about your chili and gurl, it met the hype. I cooked all night, knowing chili is better after it sits. Turned off crock pot around 3 this morning and just snuck a taste and heavens! What will i it be tomorrow?? Thank you, so much. 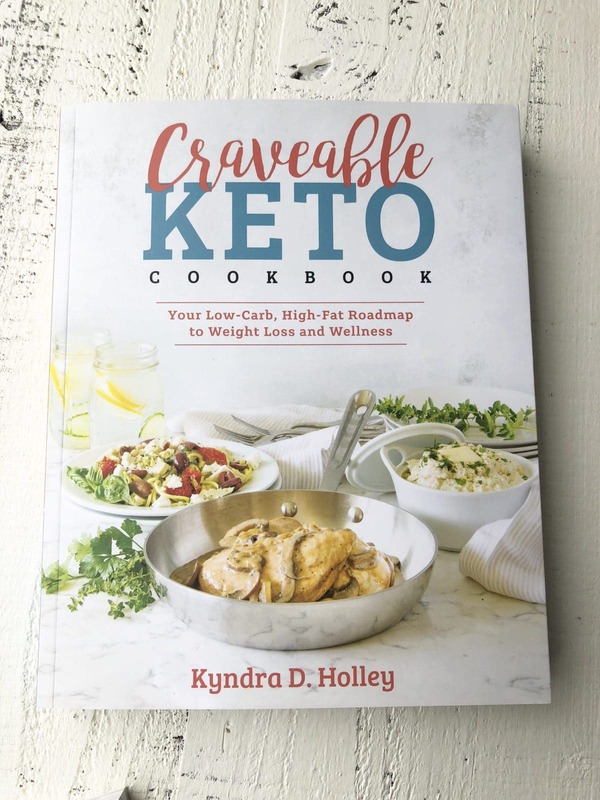 Appreciate your time and testing in the kitchen to bring us yummy and fun low carb goodness.